Now that spring has arrived it’s important to thoroughly check over the exterior of your home for issues to ensure that you are protected from the elements. 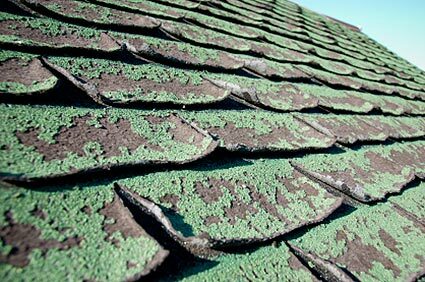 There are several factors that will indicate that your roof is in need of some TLC. In many cases some minor repair and maintenance will do the trick, but some signs will indicate that it’s time to replace your roof completely. Leaks – If you are experiencing water dripping from light fixtures (yikes!) , drywall damage, stains on your ceiling or other signs of moisture in your home it could indicate an issue with your roof. If there are any signs of leakage in your home you should have your roof inspected by a roofing contractor as soon as possible. The sooner corrective action is taken, the less likely you are to have more damage occur or mould develoment. Missing Shingles- If high winds have left your home with missing shingles, it doesn’t necessarily mean you need a new roof. Check around your home for shingles laying on the ground and have a look at your roof to see if anything looks lifted, missing or otherwise out of place. As a general rule, if you can see wood, it’s not good; seek immediate repair services. If your shingles are fairly new (12 years or less), generally in good condition, and there is not a significant amount missing a repair is most likely possible. In the event that the damage is extensive or your shingles are not in suitable condition for a repair it may be necessary to replace the damaged slope or the whole roof. Aucoin Roofing can provide you with an honest assessment of which course of action is best for your roof. Cracking, crumbling, or blistered shingles- There are several indicators that your shingles have reached the end of their useful life. If your eaves are full of granules or if you are finding shingle granules all over your deck, walkways or coming out of downspouts you should have a closer look at the condition of your shingles. If your shingles are missing significant amounts of granules, have curling corners, buckles, blisters, or cracks it is most likely time to consider a new roof or getting close to it. We can provide you with a free quote as well as advise on how urgent your roof replacement is. Missing, damaged or displaced vents or flashing- There’s more to a roof than just the shingles. If something appears to be missing or out of place it should be repaired promptly to prevent further issues. Some examples are lifted or buckled valley flashing or drip edge, missing, loose or damaged flashing around chimneys, walls or skylights, and lifted or otherwise damaged roof vents. If your shingles are generally in good condition most of these issues can be rectified with a simple repair. If something looks out of place, it is best to call a roofing professional to have it inspected. Roof is more than 15 years old or the age is unknown- The lifespan of your roof is determined by several factors; type of shingle or roofing material, installation and environmental conditions. As a general recommendation, if your roof is 15 or more years old or if you are unsure of the age, you should have it inspected by a professional for defects and to assess the condition of the roofing material. Replacement may not be required, however it is likely that some general maintenance such as caulking or minor repairs may be necessary to ensure that your roof performs as intended. If you are experiencing any of these signs, Aucoin Roofing is here to help. Contact us for a free inspection and free estimate for roof replacement or repair services.